I like making lists about living things. Colour is a great starting point for such lists, whether they're about body parts infected by microbes or the origins of science words. 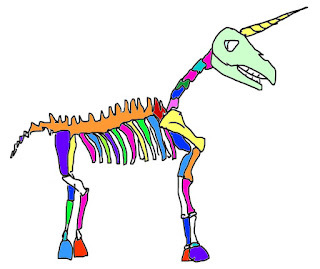 For this post, I'm going to look at how bones and teeth can take on a bunch of strange colours. 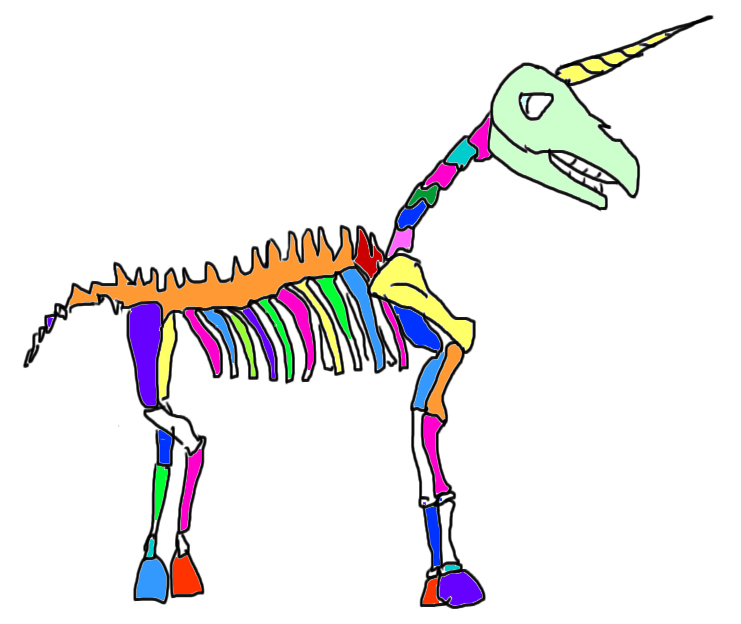 Unicorns obviously have rainbow skeletons, right? The bones of the eastern fox squirrel (Sciurus niger), a resident of trees dotting the eastern parts of Canada and the US, glow pink if you shine an ultraviolet light on them. This weirdness is due to uroporphyrin I, an intermediary in the multi-step pathway by which animals make heme. Heme is found in hemoglobin and enables red blood cells to transport oxygen. Unlike their relatives (at least as far as we know), most eastern fox squirrels have a condition called congenital erythropoietic porphyria (CEP). Essentially, this means one of the enzymes involved in heme manufacture is broken, causing production to stall at the uroporphyrin I step. Fox squirrels have a bunch of this molecule circulating inside them, and it builds up in their skeletons. CEP also occurs in other mammals including humans. Presumably they also have pink bones (I can't find anything to confirm this, which is a total bummer). Another interesting thing is people with CEP are typically very sick, yet fox squirrels seem to get along just fine with it. 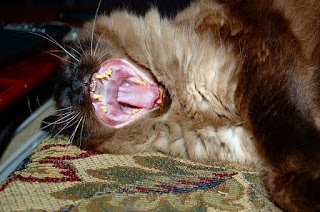 Several drugs and poisons can turn teeth and/or bones yellow. Being exposed to cadmium over a long period of time (e.g. working at a nickel-cadmium battery factory) can give you yellow teeth. Dogs dosed with thalidomide reportedly end up with yellow-green bones. Some folks even suspect eating a lot of carotene-rich foods such as carrots or sweet potatoes can turn your bones yellow. Yellow tetracycline antibiotics can cause teeth and bones to acquire a yellow-green-brown colour (one paper I read described it as khaki). This is usually seen in people who are exposed while in the womb or during early childhood. As they like to associate with calcium, tetracycline molecules tend to become stably incorporated into bone. They've been detected in skeletons from ancient Sudan and Egypt, a possible explanation being these populations ate food contaminated with tetracycline-producing bacteria. Bones containing tetracycline glow yellow-green under ultraviolet light. Eating urchins can cause the bones and teeth of the sea otter (Enhydra lutris) to turn purple. This is likely due to their absorption of antioxidant polyhydroxynaphthoquinone pigments made by the urchins. By keeping populations of algae-eating urchins in check, sea otters help maintain the kelp forests of the northeastern Pacific Ocean. The colour of a bone can also be altered after death. Artifacts recovered in France dating back to the time of the Roman Empire include fragments of green bone crafted into pins and inlays. It's thought the bones were intentionally coloured by boiling them in a salty acidic solution using a copper container, which resulted in copper being deposited within the bone and turning it green. Blue bones belonging to small animals have been recovered from San Josecito Cave in Mexico. The composition of the bones was altered over the thousands of years they spent in the cave. Specifically, the colour change appears to have been brought about by heating following the incorporation of the metal manganese (oxidizing it to the Mn5+ valence state, which forms blue-coloured salts). This mechanism also appears to explain the origins of turquoise-like ivory (odontolite) acquired from deposits of fossilized mastodon teeth and used decoratively in the Middle Ages. Chadefaux C, Vignaud C, Chalmin E, Robles-Camacho J, Arroyo-Cabrales J, Johnson E, Reiche I. 2009. Color origin and heat evidence of paleontological bones: Case study of blue and gray bones from San Josecito Cave, Mexico. American Mineralogist 94(1):27-33. Ferrand J et al. 2014. On the origin of the green colour of archaeological bone artefacts of the Gallo‐Roman Period. Archaeometry 56(6):1024-1040.